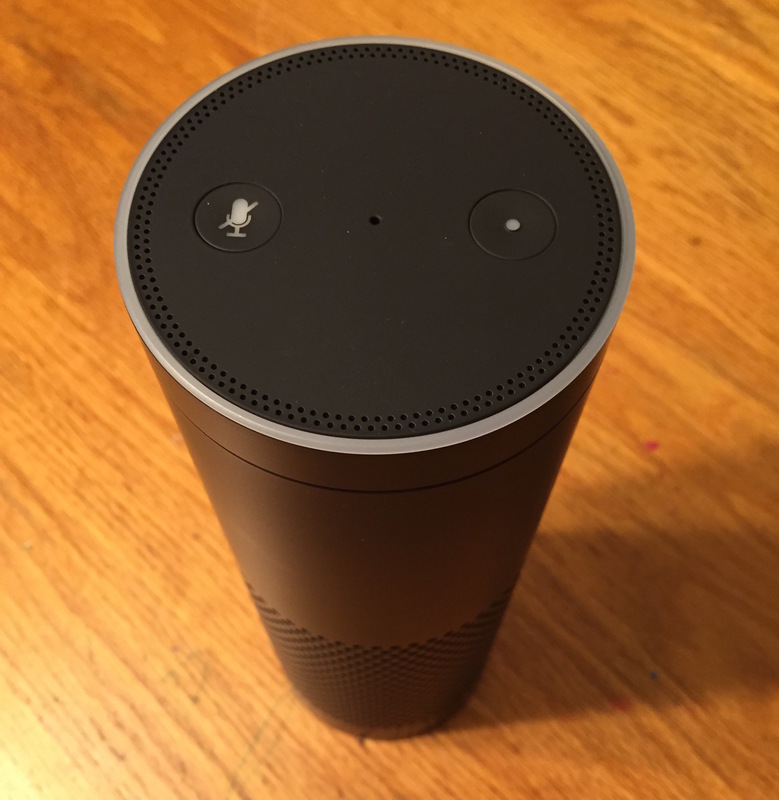 When Amazon first announced the Echo and the accompanying promotional video, I was torn. The aspirational concept at work was great. A precursor to Jarvis, the digital butler from the Iron Man movies. Tony Stark’s AI-powered smart house is what I think the dreams of virtual assistants like Siri and Cortana hope to one day realize. However, we’re not there yet, and the cost of adding “intelligence” and automation to one’s home is far more than a middle class family can reasonably expect to afford. But, that doesn’t mean that certain aspects of this ambitious future can’t be achieved today. Voice recognition has come a long way, and virtual assistants are getting more capable every day. Enter Amazon Echo. By now, nearly everyone in America has access to some sort of smartphone or tablet that includes a virtual assistant. Whether it’s Siri, Cortana, or Google Now, users can simply speak or type a natural language request and receive desired results. Even devices that don’t come with a virtual assistant built-in can almost always install apps that provide some, if not all, of the same features. But, when your hands are otherwise occupied, getting your phone out to do some menial task can be aggravating. And while, yes, iPhones and Android devices are capable of listening for a “wake word” to trigger voice actions without pressing a button, the results are often hit or miss (and, at least on the iPhone, require it to be plugged in and charging). When the Echo arrived, I was struck by how much smaller the box was than I expected. It had been some time since I watched the reveal video and had forgotten just how compact the device is. But I was pleasantly surprised by the quality of the packaging. Amazon has really impressed me with their Apple-esque attention to packaging detail. When I purchased my Amazon Fire TV Stick, I noticed the same attention to detail for beautiful packaging. 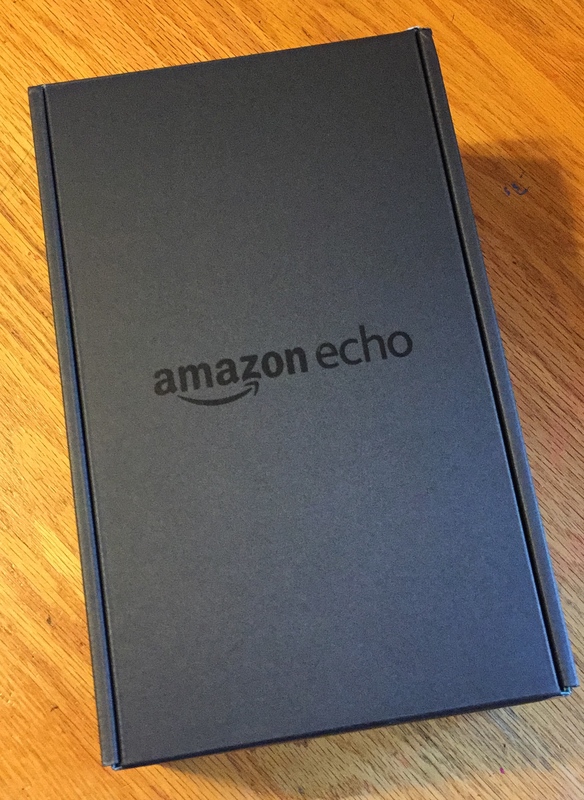 While I still think Apple does a better job of not wasting any space in their package design, I had to admit that unboxing the Echo was a very delightful process: something that has long-been Apple’s forte (almost exclusively so). 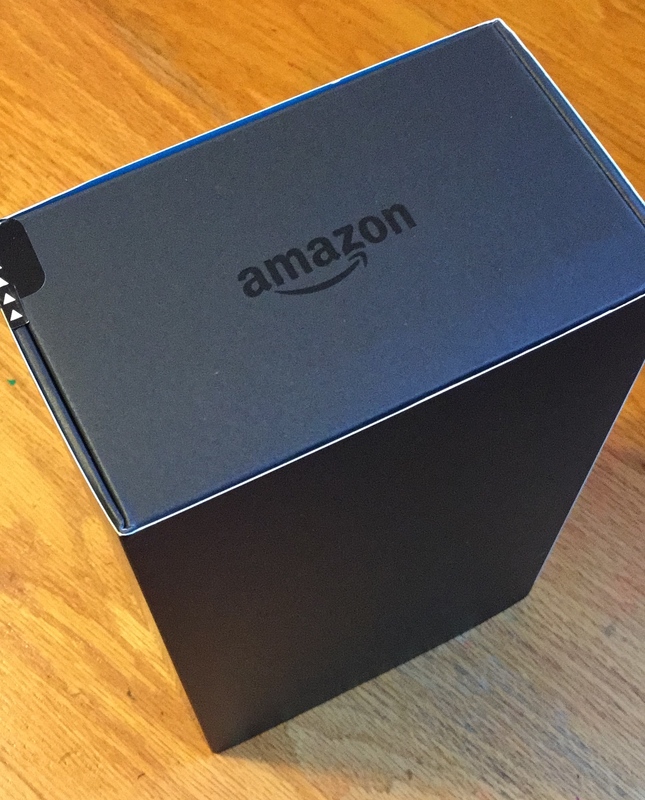 The Echo box bears a striking resemblance to the Monolith from 2001: A Space Odyssey. The first thing I noticed, of course, when I set the box on the table and prepared to open it was how much it resembled the Monolith from 2001: A Space Odyssey: a comparison that places no small amount of pressure on the contained device to assist its users in their technology-assisted evolution. I carefully removed the outer shell and laid the box flat to get a look at the subtly embossed product logo on the box. Every picture from here on out will pale in comparison to the first. Like an echo. And then I opened it up and was actually pleasantly surprised by what I found inside. The Echo was placed gently into a curved cradle that protruded from both the front and back (or top and bottom, depending on your preferred spacial orientation) of the box. Where many tech companies would have been content to just place the Echo in a recessed space, Amazon went the extra step to ensure that the front of the Echo was protected during transit. At this point, I took one last photo of the box and then proceeded to the fun times. 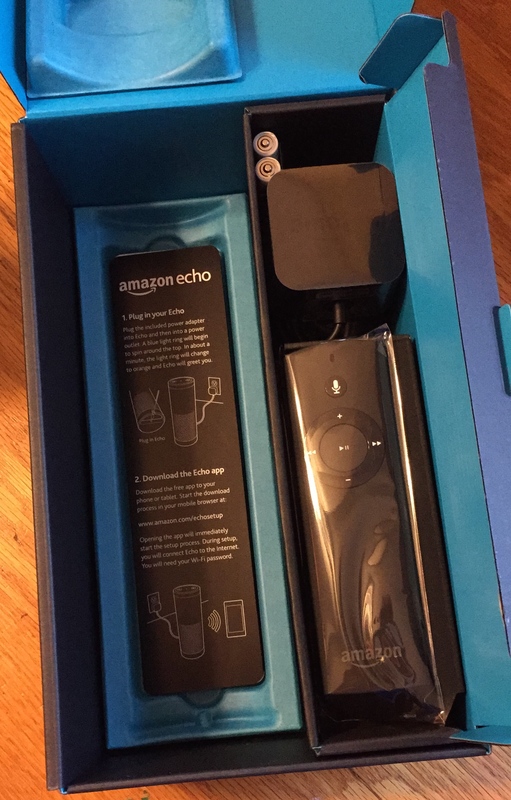 The instructions in the box were incredibly simple and easy to follow, though they omit the ability to setup your Echo using a web browser on your Mac or PC, a feature worth noting for anyone wishing to use an Echo without one. I simply plugged the power outlet into the wall and then into the Echo, fired up the Echo app (which I had already downloaded on my phone as soon as it became available), and the app walked me through the setup process. The only part that wasn’t seamless was when I was required to connect my phone to the Wi-Fi network the Echo created to create the initial sync before telling the Echo to which wireless network it should connect. I have been spoiled by the use of Bluetooth to quickly pair and set up Apple TVs with your iPhone. But, this seems to be the most effective method for the setup of a device that needs to work with several different platforms, especially since the Bluetooth features of the Echo appear to be limited to streaming audio from a smartphone, tablet, or computer to the Echo’s speaker. And then, just like that, the Echo was ready to use. The app walked me through several example queries and commands to get me comfortable with the device and then I was off and running. My children were enamored with her, though perhaps the most adorable moment was when my daughter tried to activate her by calling her Siri, rather than Alexa. A few more taps inside the app itself and I had paired my iHeartRadio account and set off a stream from a local radio station via TuneIn. Unfortunately, I was a little disappointed to discover that there is not currently support for Audible content (though I have been informed by Amazon support that they are working hard to bring more audio sources to the Echo). My son has recently become quite persistent in his requests to listen to the Star Wars radio drama and I must admit that I would love the ability to stream them to the Echo while I’m working in the kitchen. Fortunately, a workaround exists: simply redirect the audio from your iPhone or other smart device to the Echo via Bluetooth. However, I have not yet had the opportunity to test it and see if Echo can remotely pause audio playing from a third-party device. As with Siri, much of the fun of the Echo comes from trying to get her to respond in entertaining ways. For example, my son asked her to “Set phasers to kill,” to which she replied “That’s a feature for a later version!” The Echo also includes a voice training feature, which I’ve not yet tried. I am hoping that it can be used to improve understanding of my children, as they’ve not yet learned to articulate. However, she already does a remarkable job of recognizing my requests. In fact, the only issue I’ve had so far with the Echo is that I don’t know what else to do with it. It makes for an excellent Bluetooth speaker and Internet radio device. But, I hope for so much more. One exciting feature of the Echo that I’m hoping gets better over time and with usage is the Flash Briefing. This particular feature is one of the key things I want from a digital assistant: the ability to quickly get brief news snippets, the weather, and other info about my upcoming day while I’m getting ready in the morning. Unfortunately, I was so tired this morning, I completely forgot to ask Alexa to give me one. I suppose I’ll just have to do it tomorrow. There are several other 1.0 features that I’m hoping to see get better in 1.1, 1.2, or even 2.0. For example, the Echo has the ability to set an alarm for you. However, there are no options for configuring alarm repetition (I would love to have an alarm that goes off every weekday, but not at all on weekends). Part of me hopes that Amazon decides to go all out with the Echo and eventually allow you to sync it with an iCloud or Google calendar so that you can be notified of upcoming appointments, find out what the roads are like on the way to the movies or date night (currently, it can only give you information on your daily commute), or even schedule events for you. While Amazon may have their own ecosystem that they want you to use, it’s clear that the Fire Phone is never going to be popular enough for features like that to exist as an Amazon exclusive. But if the Echo can outdo Siri and Google Now in convenience and tie into their respective ecosystems slightly, they might be able to carve out a nice niche in the home before the battle for the smart home truly heats up. The top of the Echo has a ring that adjusts volume, and has just the right amount of heft to feel awesome. Until then, I’m happy with my Echo. As Amazon adds features, I hope to discover that I like it enough to have several in my home in different places for different purposes. I also look forward to the day when I can rename my Echo to Jarvis, give it a male voice with a stuffy, British accent, and ask it it power up my Mark IV armor. A man can dream, can he not? If you squint just right, the top of it almost looks like a face.